This image represents a sodium chloride crystal. 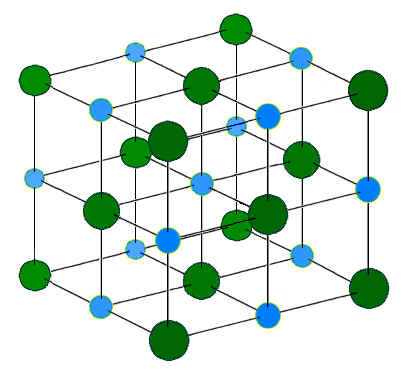 In this image we can see the cubic crystal habit on the microscopic level. All table salt crystals are always cubic. They don't have any choice. You probably ate some today!!! The large green balls represent Cl- ions, the small blue spheres represent Na+ ions. There is one blue for every one green so the chemical formula is Na1Cl1. Chemists never write the 1's though so it is shortened to NaCl.